LaSalle protests simultaneous road closures to de la Verendrye exit, Angrignon Blvd. The LaSalle borough is appealing to Transport Quebec to rethink plans that would shut down the de la Verendrye exit and a portion of Angrignon Blvd. at the same time, which officials said would cause a traffic nightmare. Transport Quebec will demolish part of the Angrignon overpass That means between the Lachine Canal and Notre-Dame St., traffic on Angrignon will be reduced to one lane in each direction. Only drivers in one direction will be able to travel across at a time. The de la Verendrye exit is also closing in December for work on Highway 15 south. LaSalle Mayor Manon Barbe said the closures would make getting to and from LaSalle extremely difficult and the effects wouldn’t only be felt by commuters, but by businesses. The closures are expected to begin in January and last roughly a year. 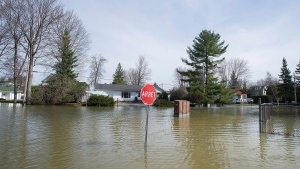 “We know it will have an impact on people in the borough of LaSalle and also people travelling in this area,” said Transport Quebec spokesperson Martin Girard. Barbe was hoping one of the closures could be delayed to limit disruptions. Instead, the work is scheduled to happen simultaneously. “This is the worst scenario for us, for LaSalle, for the business, for the industries, the citizens living in LaSalle,” she said.